This is a place for the in depth discussion of the sea and people of the sea. Tradesmen, Pirates, Privateers, Buccaneers, Seafarers, Sailors of past and present and the ships they sailed. Many have come to believe that there was an element of the magician in every seafarer. They could predict the weather by the haze in the sky or by a change in the smell of the salt air. They could identify a school of fish by the way the water roiled. They could locate seldom-visited spots in the open ocean, not by landmarks--for there were none--but by the contours of the bottom and the patterns of the tidal runs. Seafarers are possessed of many other qualities as well: an ability to endure boredom, loneliness, and separation; instincts, honed by experience, that trigger instantaneous responses to sudden emergencies; loyalty to one another, coupled with faith in themselves; a fierce independence, sometimes at the expense of comfort and family. And this above all is possessed by every seafarer: a profound, abiding, unwavering respect for the sea. He or she may enjoy the sea, may profit from it, may hate it and wish to leave it, but, one and all, they know that their lives continue only at the sufferance of the sea. No wonder, then, that they personify it as a god or demon, a friend or enemy. For, come the day when it turns upon them . 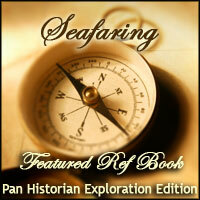 . .
Seeking Eclectic Information About All Aspects of Sailing Ships? Click through to Tall Ships and How They Work! ! Want To Read Biographies about The Notorious Pirates That Sailed the Seven Seas? Join Us at The Squawking Parrot For a Drink and a Song!